It was over 22 years ago when Bob was on one of his early flights as a student, piloting a Cessna 152 in the Lower Mainland of British Columbia. He and his instructor were flying northbound in the vicinity of Stave Lake (Sayres Lake just south of the powerhouse to be more precise). They were at about 2000 to 3000 feet and the time was between 6:00 and 7:00 pm. Bob was practicing a particularly demanding exercise called "slow flight" where the student practices flying the plane on the verge of a stall. He was very nervous about the task and was concentrating heavily during the meager 55 knot flight. His instructor had his head down at the time making notes and watching the instrument panel. 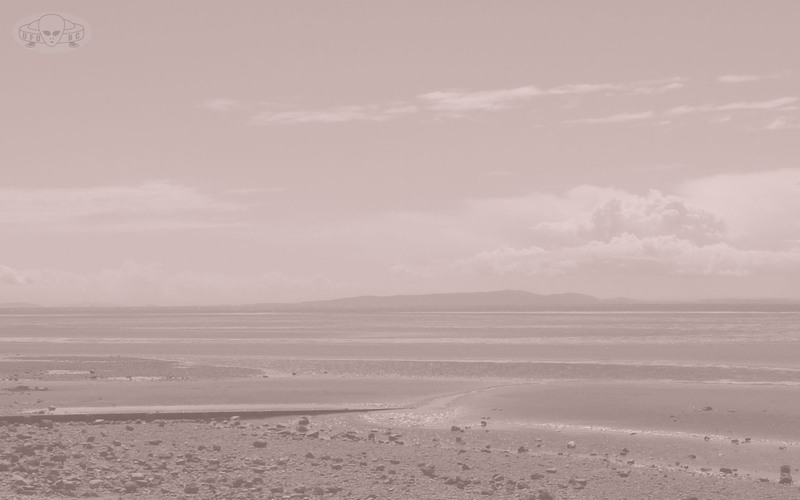 Suddenly, Bob noticed ahead of them on the horizon what he thought to be another aircraft, a helicopter perhaps since it was relatively stationary and it was not elongated in form. He pointed it out to his instructor who took note of it but did not seem concerned, as it appeared to be relatively far away. Back in those days, pilots were not required to wear headsets so no communication attempt was possible with the apparent aircraft. They continued to fly northbound toward the object and were about ½ mile away when Bob could see more detail. "I don't think it's a helicopter" he alerted his instructor. His instructor looked up and immediately said "I have control" meaning he was taking over piloting the Cessna? The instructor proceeded to increase power and pull in the flaps to obtain a speed of about 85 knots for greater aircraft stability and maneuverability. Within a short period of time they passed just to the left of the object. The "unknown" was in fact two objects connected with some sort of cord or tube. The objects were nearly identically, each the shape of a garbage can with slight conical tops. One was slightly smaller than the other. The larger one was slightly higher and appeared to be towing the smaller one. They were totally amazed at what they had just seen and wanted another closer look, so the instructor went into a tight 180 turn to the right. Since they were flying a high-wing aircraft, the wing obscured the view to the south (where the objects were) during the turn. As they came out of the turn the objects (or object) were still there. They flew by them a second time, again passing slightly left of the UFOs. The sight was unbelievable, each object was about the size of a small car and the tube connecting them was about 2 feet thick. 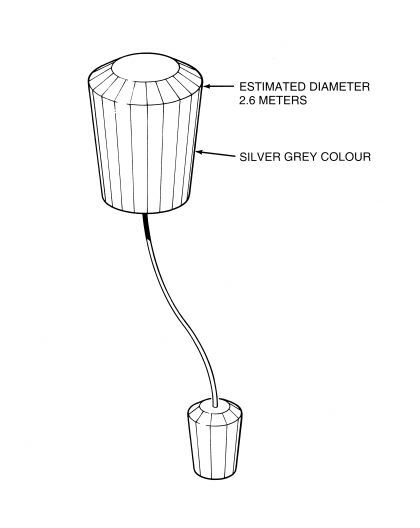 The objects and tube were a silver-metallic colour. There were no rotors, no jet engines. As they flew southbound they decided that they just had to have another look. They did another 180 degree turn to the right, losing sight of it again due to the wing. They straightened out and to their disbelief, the objects were gone! The instructor suggested that they should not report the incident but no reason for this was discussed. Up to that time, Bob had no previous UFO sightings. When questioned about the possibility of the object being a balloon he stated that it could not have been since its relative approach speed was much greater than a stationary object. He is familiar with flying by small helium balloons. This object approached much quicker. Bob continues to fly today and has between 3000 to 4000 hours of flight time. He has not seen anything unusual since the 1982 event. The date of the event was obtained from his logbook. Figure 1. 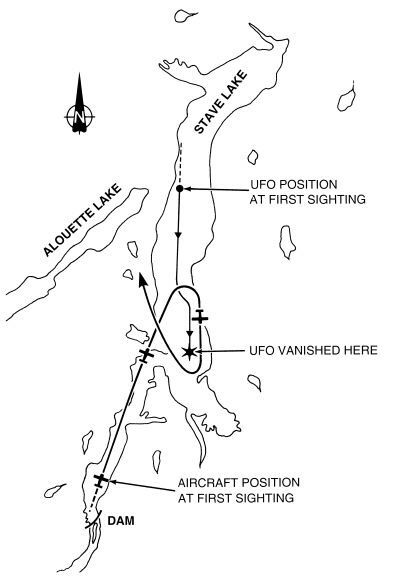 Map showing flight paths of UFO and Cessna. Illustration by Gordon Hindle. Figure 2. Illustration of UFO by Gordon Hindle. Figure 3. 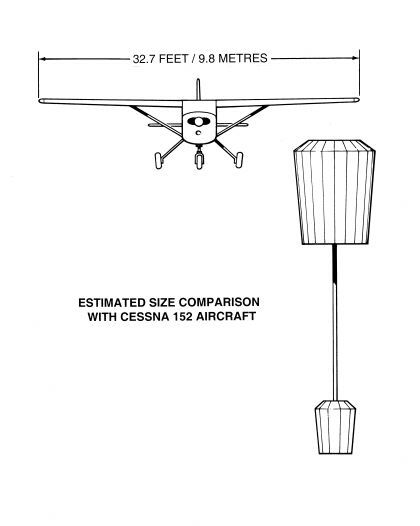 Comparison of size of UFO with Cessna.